Marie-Adélaïde (Marie Adelheid Thérèse Hilda Wilhelmine; 14 June 1894 – 24 January 1924), reigned as Grand Duchess of Luxembourg from 1912 until her abdication in 1919. She was the first Grand Duchess regnant of Luxembourg (after five grand dukes), its first female monarch since Duchess Maria Theresa (1740–1780, who was also Austrian Empress) and the first Luxembourgish monarch to be born within the territory since Count John the Blind (1296–1346). Named as heir presumptive by her father Grand Duke William IV in 1907 to prevent a succession crisis due to his lack of a son, Marie-Adélaïde became Grand Duchess in 1912. She ruled through the First World War, and her perceived support for the German occupation forces led to great unpopularity in Luxembourg as well as neighbouring France and Belgium. In 1919, on the advice of Parliament and after enormous pressure from the Luxembourgish people, she abdicated on 14 January 1919 in favour of her younger sister Charlotte who managed to save the monarchy and the dynasty in a national referendum (28 September 1919). After abdicating Marie-Adélaïde retired in a monastery in Italy, before leaving due to ill health. She died of influenza in Germany on 24 January 1924 at the age of 29. Marie-Adélaïde was born on 14 June 1894 in Berg Castle as the eldest child of Grand Duke William IV and his wife, Marie Anne of Portugal. Since her father had six daughters and no sons, he proclaimed Marie-Adélaïde as the heir presumptive on 10 July 1907, in order to solve any succession crisis due to the use of Salic law in the monarchy. Due to that same Salic Law, the elder branch of the House of Nassau, called Nassau-Weilburg (present-day Luxembourg-Nassau) inherited in 1890 the throne of Luxembourg from the younger branch called Nassau-Orange, which was not only supplying the Grand Dukes of Luxembourg from 1815 to 1890, but was also in a personal union the reigning dynasty of the Kingdom of the Netherlands. Consider it, gentlemen, as a happy moment for the future of the country, the fact that the Grand Duchess Marie-Adélaïde is the first of our sovereigns to have been born on the Grand Ducal soil, the first to have been raised there, and who, from her earliest childhood has breathed the air of our native land and learnt the ideas, the aspirations and the traditions of the people to whom she has been called reign over. It is my desire to judge according to the requirements of justice and equity which will inspire all of my acts. The law and general interest will only guide me. Judging fairly: it is not merely equal justice for all, but a protective justice for the poor and weak. The growing economic inequality between men is the greatest worry of our age. Social peace, no matter how ardently desired, remains to this day an elusive ideal. Is it not necessary to work on reconciliation and solidarity? Marie-Adélaïde was deeply interested in politics and took an active part in the government and the political life of the Grand Duchy in accordance with the Luxembourgish Constitution which at that time granted the monarch extensive political powers. She was a devout Roman Catholic, with strong religious convictions and very conservative political views. On the day of her ascension to the throne – 25 February 1912 – she refused to sign a new law reducing the role of Roman Catholic priests within the education system. Later, in 1915, she hesitated before appointing the mayors of Differdange and Hollerich, both known for their anticlerical views. With the outbreak of the First World War in 1914, the German Empire violated the neutrality of Luxembourg established and recognized in International Law by invading the country on 2 August. Although Marie-Adélaïde issued a formal protest, this did nothing to prevent the military occupation of Luxembourg. She decided not to resist the occupying army, but tried instead to maintain formally her country's neutrality throughout the war. However, during the war she developed a rather cordial relationship with the German occupiers (including hosting the German Kaiser Wilhelm II in the palace and allowing the German Kronprinz to establish his temporary military headquarters in Luxembourg City), an attitude which made her very unpopular with the Luxembourgish population, especially after she refused as well to send away her German entourage who was part of the Grand Ducal Household (palace personnel). Meanwhile, in late 1916 the Grand Duchess caused controversy by dissolving the Chamber of Deputies to solve the deadlock faced by the Loutsch Ministry, which was composed of Party of the Right members and did not have a majority in the Chamber. Marie-Adélaïde ordered the Chamber dissolved and new elections held on 23 December 1916. This action was permissible under the Constitution, but regarded as unconventional, and provoked an outcry and long-term resentment among the socialists and liberals in parliament, who saw it as resembling a coup d'état. After the end of the war Marie-Adélaïde was harshly criticised for her attitude and the perception of the Grand Duchess as pro-German led the French government to declare: "The French Government does not consider it possible to have contact or negotiations with the Government of the Grand Duchess of Luxembourg, whom it considers as gravely compromised …"
Although she had not done anything flagrantly in contradiction with the Luxembourgish Constitution (of 1868, with a major revision in 1919 after her departure), voices in Parliament began to demand her abdication in January 1919. At the same time, prominent political figures in both neighbouring France and Belgium were adopting annexationist plans towards the Grand Duchy and thus had a vested interest in further discrediting Marie-Adélaïde. On 9 January, a group of Socialist and Liberal Luxembourgish Members of Parliament ("Deputies") publicly proclaimed a republic after losing a vote in parliament to abolish the monarchy, a situation which was followed by public unrest in the streets requiring even the intervention of the French Army to restore order. 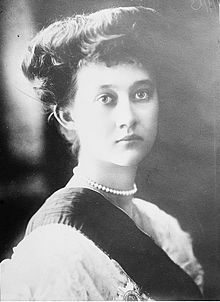 Under intense national (and international) pressure, and after consulting with the Prime Minister, the 24-year-old Grand Duchess decided to abdicate (14 January 1919). She was succeeded by her younger sister, Charlotte. After her abdication Marie-Adélaïde went into exile by travelling through Europe. She entered a Carmelite convent in Modena, Italy, in 1920. Later, she joined the Little Sisters of the Poor in Rome, taking the name "Sister Marie of the Poor". Her worsening health did not allow her to remain a nun, however, and she eventually had to leave the convent. She then moved to Schloss Hohenburg in Bavaria, where she died of influenza in 1924. On 22 October 1947, her body was interred in the Grand Ducal Crypt of the Notre-Dame Cathedral in the city of Luxembourg. ^ a b c d "Marie-Adélaïde - Cour Grand-Ducale de Luxembourg - Les Souverains". www.monarchie.lu (in French). Retrieved 2 January 2016. ^ Péporté, Pit (2010). Inventing Luxembourg: representations of the past, space and language from the nineteenth to the twenty-first century. BRILL. p. 90. ISBN 90-04-18176-8. ^ a b c d Thewes, Guy (2011). Les gouvernements du Grand-Duché de Luxembourg depuis 1848 (PDF) (in French). Service Information et Presse. p. 65. ISBN 978-2-87999-212-9. ^ Donovan, Henry. "Chicago Eagle". Illinois Digital Newspaper Collections. Retrieved 26 June 2015. ^ This section was translated from the same article in the German version of Wikipedia. ^ a b It was customary for a reigning Grand Duke, his heir apparent, and their spouses to use the style of Royal Highness. Junior non-reigning members headed by a Grand Duke instead used the style Grand Ducal Highness. Since 1919, when Grand Duchess Charlotte married Prince Felix of Bourbon-Parma, all the male-line descendants adopted the style Royal Highness, in capacity of being a descendant of the Royal House of Bourbon-Parma. ^ "Grand Duchess Marie-Adélaïde of Luxembourg". Unofficial Royalty. Retrieved 2015-12-10. ^ "Grand Duchess Marie-Adelaide of Luxembourg". forum.alexanderpalace.org. Retrieved 2015-12-10. Wikimedia Commons has media related to Marie-Adélaïde, Grand Duchess of Luxembourg. O'Shaughnessy, Edith. Marie Adelaide, Grand Duchess of Luxemburg, Duchess of Nassau. New York: Jonathan Cape and Robert Ballou, 1932. Schous, Marie. Marie Adelheid van Nassau, Groothertogin van Luxemburg. 's Hertogenbosch: G. Mosmans, 1931. Marburg, Theodor. The Story of a Soul. Philadelphia: Dorrance, 1938. Leighton, Isabel, and Bertram Bloch. Marie-Adelaide: A Play. New York: Rialto Service Bureau. This page was last edited on 7 March 2019, at 01:01 (UTC).